We’d love your help. Let us know what’s wrong with this preview of Let's All Be Brave by Annie F. Downs. Download TWO FREE CHAPTERS here. Annie F. Downs admits she's not exactly the bravest girl in the world. She still cries sometimes when she leaves her parents' home in Georgia, she's never jumped out of a plane, and she only rides roller coasters to impress boys. But Annie knows that courage resides inside each and every one of us, and she's on a mission to triumph over he Download TWO FREE CHAPTERS here. To ask other readers questions about Let's All Be Brave, please sign up. I have seen this book reviewed on several blogs this summer so I was thrilled to get the chance to read it. I've never heard of Annie F. Downs or read her blog but the reviews were all great and a book about courage has to be awesome, right? I just couldn't get into this book. I tried, I really did, but I didn't like it. First of all, this book is about courage, yet the most courageous thing the author did was move overseas (then back again a few months later) and then a few hours away from her p I have seen this book reviewed on several blogs this summer so I was thrilled to get the chance to read it. I've never heard of Annie F. Downs or read her blog but the reviews were all great and a book about courage has to be awesome, right? First of all, this book is about courage, yet the most courageous thing the author did was move overseas (then back again a few months later) and then a few hours away from her parents and cried every time she left from a visit. I didn't feel a vibe of courage from her throughout the book at all. Second, the author and I are of the same age (actually, she's a year older) but I felt as though I was reading a book written by a teenager. The writing is not bad at all, but the season that she is in is a completely different one then my own. Maybe that's it...I feel this is a book written more for a teenager (her other books are) than an adult, married woman raising her own family. I am in love with this book! It's very encouraging and makes me feel like I need to go do all the things I have been too afraid to do! Yes we all need to be brave! I love how Annie writes! Added bonus to the book was finding she mentioned my sister on page 147! Love it!!! This took me maybe a year to read. But it was worth it. Read if you need encouragement to be brave and to follow God unto all the ways He’s asking you to be brave, knowing He will always be with you. I enjoyed this book but Remember God is my favorite. A good reminder to dare to be brave and do hard things with and for God. This book was easy to read and had a good flow. There were many aspects of this book that I enjoyed, such as the fact that she is capable of writing from different points of view, which is something that I find immensely satisfactory. One of my favourite lines in this book is, "Somewhere, at some point, she started being brave--- probably before she even realized it. It wasn't when he told me. It was long before, when something in her heart began to beat with a different rhythm." This line stru This book was easy to read and had a good flow. There were many aspects of this book that I enjoyed, such as the fact that she is capable of writing from different points of view, which is something that I find immensely satisfactory. One of my favourite lines in this book is, "Somewhere, at some point, she started being brave--- probably before she even realized it. It wasn't when he told me. It was long before, when something in her heart began to beat with a different rhythm." This line struck a chord with me because one does not start to become brave when they do an action, it is when one begins to have a change of heart. There is a point in the book where she talks about how she signs up for a marathon with her friends, and she plans to train herself, but she ends up not doing anything to prepare for it. This is basically me. I always plan to do things but I never actually go through with it because I am a slothful person to be frank. In this chapter she writes about discipline and practice, and I am glad she wrote about that because I feel like I have learned a lot from that chapter. She makes a point about how discipline are not rules you have to follow, but it is something you choose to commit to to hone your skills. This was not a book about being single, but that was part of it. This was not a book about changing jobs, but that was part of it. This was not a book about moving to new places, but that too was part of it. And this book was exactly what I needed to read at this point in my 30-something-single, restless, scared-to-step-out-of-my-comfort-zone life. I have had this book for ages and decided to read it to finish up my reading goal. This book was the perfect book to finish up the year. It inspires me to be brave and to start my new year making braver choices. I always love Annie's writings so I knew I'd love this book, but one main chapter touched my heart more than her writing typically does. It was towards the end and called "Jesus" which brought me to tears. This book is definitely worth reading! This book was so sweet. I love that it's fairly raw, seems journalistic and daily entries-esque. You feel like you're along the journey with her - she has great humor, great voice and tone. Overall enjoyed this book for a light hearted, feel good and empowered, quick, easy read. One of those books where I was just so sad that it ended. Annie writes with this beautiful balance of humor and deep connection to the Bible and understanding of what it means to walk in bravery with Christ. Quick read. Enjoyed it and took away some sweet encouragements about courage and Jesus. 3 or 3.5 stars. Full review to come. Earlier this year I enjoyed reading and reviewing Annie Downs’ first book, Perfectly Unique. So when I read that Annie was writing a book on being the brave person God created you to be, I was excited. Some of you who know me well know that I am not a brave person. I struggle daily with being a people-pleaser, battling my natural tendency to be consumed with making sure those around me are happy, suffocating in the little boxes I try to squish myself into, just to make sure other people like me. I Earlier this year I enjoyed reading and reviewing Annie Downs’ first book, Perfectly Unique. So when I read that Annie was writing a book on being the brave person God created you to be, I was excited. In an effort to grow in 2014, in an attempt to shake off the opinions of others and embrace who I am, I chose Brave as my ‘word of the year’. But I don’t think I’m alone in this struggle. Just look at pop culture right now– if the films we watch, the music we listen to, and the books we read are any reflection of our personal lives, I would say the majority of people (girls and women, in particular) face this issue of being brave. We are a culture being inundated with the message that we can be brave. Our heroines, from Katniss Everdeen to Tris Prior, know what it is like to struggle to choose to be brave. Our favorite singers, from Sara Bareilles and Moriah Peters to Hunter Hayes and Taylor Swift, belt out tunes that let us know we aren’t alone in this struggle to embrace who we are designed to be. And Annie Downs knows what it is like, too. 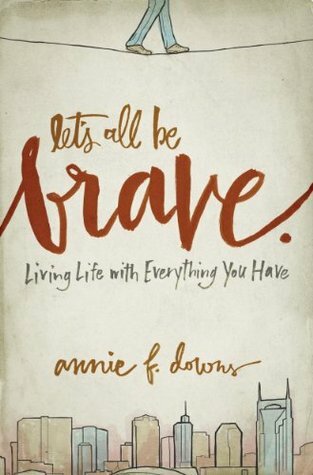 In Let’s All be Brave, Annie shares deeply personal stories of how her life has been riddled with doubt and fear, lacking bravery. But Annie does more than just tell us to be brave. In her outrageously humorous way, she makes us feel as though we are drinking lattes together in a downtown coffee shop, a safe place where we can acknowledge together that no, we aren’t brave, but God created us to be vibrant individuals, living life fully, taking risks for the glory of God. More than a pep talk, Let’s All Be Brave is a reminder that God didn’t give us a spirit of fear (2 Timothy 1:7), but that he designed each of us with unique talents and passions, and that it is our job to use them wisely. Encouraging us to believe not in ourselves, but in the One who made us, Let’s All Be Brave will make you laugh and cry. Overall, I found Let’s All Be Brave to be an excellent and easy read that I would highly recommend, and I would give it an “A”. Disclosure of Material Connection: I received this book free from the publisher through the BookLook Bloggers Review Program. I was not required to write a positive review. The opinions I have expressed are my own. I am disclosing this in accordance with the Federal Trade Commission’s 16 CFR, Part 255. Let's All Be Brave is a book for me, and for almost everyone--it's another in a progression of autobiographical memoir-type reflections by highly committed Christians I've been reading, books by folks brave enough to open themselves up and be more than a bit vulnerable to a general public. Like a close friend who's not too clingy, Annie Downs brings the reader along as she walks, talks, and travels. From Georgia to Tennessee to Edinburgh. As she takes her portable office (laptop) into the snack Let's All Be Brave is a book for me, and for almost everyone--it's another in a progression of autobiographical memoir-type reflections by highly committed Christians I've been reading, books by folks brave enough to open themselves up and be more than a bit vulnerable to a general public. Like a close friend who's not too clingy, Annie Downs brings the reader along as she walks, talks, and travels. From Georgia to Tennessee to Edinburgh. As she takes her portable office (laptop) into the snack emporium or coffee shop. Chapter titles are short and fun: just start; say yes; say no; hold on; let go. Annie writes about the stuff of life in an easy, natural conversational voice. Transitions, relocations, disappointments, relationships, quandaries about what now, what's next--Annie reveals her experience, her responses in the Spirit of grace, her theological and other takes on the same type of life stuff each of us has been through and know we'll deal with again. "Grace" is my word for this year 2015; in this book about bravery, Annie reminds us grace has rhythms of start, stop, race, slow down, hesitate. In Spanish "hope" and "expect" are one and the same word: espero. In essence that means hope already is almost realized whenever you claim "¡espero!" Annie tells us it's about radical hope [page 163] that I'd further describe as deeply planted, solidly-rooted, almost impossible to uproot, throw away, destroy. I'll take a bow to Annie's Wesleyan heritage and say that's prevenient grace. That's God's ongoing presence and action each of us bravely can dare to trust. 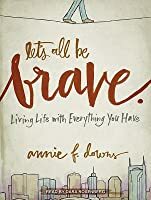 In Let’s All Be Brave, Annie F. Downs writes inspiring words of bravery and courage – and I know I, for one, needed to read them. Not always an easy choice to make, bravery is worthwhile, and Downs boldly tackles the challenging aspects of making the choices to overcome fears and live bravely every day. Her voice shines through her prose beautifully and conversationally, and her message is clear, down-to-earth and applicable. I felt challenged and encouraged as I read, and I am sure other readers will feel the same. Let’s All Be Brave is a quick, easy read and serves as a great reminder, and I definitely recommend it. This was such a great book! I loved how she approached writing it and incorporating more personal experiences to teach the lesson or tie into a thought. The last few chapters really started to hit hard for me. This book tied in great with a book I read earlier this year (The Best Yes by Lysa TerKeurst) since making best yes decisions and being brave usually go hand in hand. Annie writes like you're talking to a friend. Through these short essays and stories from her life and lessons, I was encouraged and challenged to identify my God-given dreams and bravely pursue them. It's not deep theology or heady challenges, but everyday nudges and the perfect "over a cup of coffee" book. This book was purchased for me by my sister and at a perfect time in my life for bravery. I enjoyed the Christian perspective that was accessible and not overwhelming. She tells life stories that support living in faith and bravery. For me - I am more aware of daily decisions and choices that I make that lean toward bravery or fear. I'm working on choosing bravery more and more daily. Let's All be Brave is an honest, easy-to-read memoir about following God and living by faith. I would recommend it to any young woman who is serious about finding the will of God and doing it even when it scares her. It took me a while to get through this, but I really liked it! I feel like I can relate to the author, and I love how she encourages everyone to bravely do what God asks, not worrying about what others may think. I would recommend this book to every young Christian. Wait...to every Christian no matter the age. Read this book. Let's be brave together! It took me a while of sitting here to figure out how to review this book. I'm still not sure how. See, this isn't my usual type of book. Yet, something about this one spoke to me, drew me in. Annie wrote with open honesty and vulnerability typical of these kinds of books. She shared things from the deepest parts of her life. Her hopes, her dreams, her fears. She illustrated these points with stories from her life, or with stories from Scripture, which I thought was exceptionally well done. Howev It took me a while of sitting here to figure out how to review this book. I'm still not sure how. See, this isn't my usual type of book. Yet, something about this one spoke to me, drew me in. Annie wrote with open honesty and vulnerability typical of these kinds of books. She shared things from the deepest parts of her life. Her hopes, her dreams, her fears. She illustrated these points with stories from her life, or with stories from Scripture, which I thought was exceptionally well done. However, Annie is first a blogger, and that showed, as I think her writing style didn't completely translate into book writing. The timeline also jumps around quite a bit, which really confused me. Each chapter has when and where she wrote that particular chapter, so that jumps around. But even in those sections she may be talking about something that happened in the past, or "two weeks ago". But ultimately, this was one that spoke to me. It saw straight through me, told me that I am not alone when it com to some of the things that I face. Which, to me, makes it hard to rec. Because if it doesn't speak to you, will you not like it as much? Yet I do recommend this one, a lot. It was full of truth and wisdom and, of course, some Annie humor. Annie F. Downs is an author, blogger, and speaker based in Nashville, Tennessee. Flawed but funny, she uses her writing to highlight the everyday goodness of a real and present God. An author of three books- Let's All Be Brave , Perfectly Unique , and Speak Love , Annie also loves traveling around the country speaking to young women, college students, and adults. Read more at anniefdowns.com a Annie F. Downs is an author, blogger, and speaker based in Nashville, Tennessee. Flawed but funny, she uses her writing to highlight the everyday goodness of a real and present God.